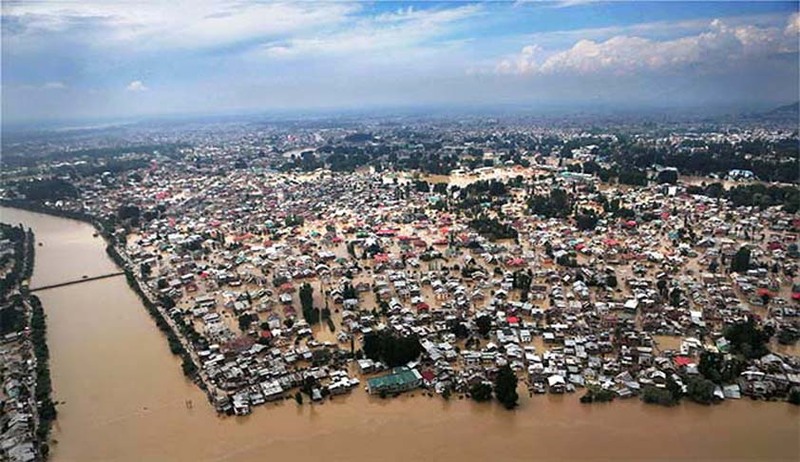 The Supreme Court today notice of the massive floods in the Kashmir valley in a petition filed by social activist and lawyer Vasundhara Pathak Masoodi. Appearing for the petitioner, Senior advocate Gonsalves presented a note to the Court, which mentioned that“eight districts namely; Kulgam, Anantnag, Shopian, Pulwama, Ganderbal, Baramulla, Budgam and Srinagar are gravely affected by the floods.”Immediate requirement of large number of helicopters, doctors, medicines, food including pediatric food, baby articles, blankets,life jackets, drinking water, sanitary pads, tents, warm clothes and footwear, fuel and other essential supplies was also mentioned in the note presented by Mr. Gonsalves to the Court. The petitioner submitted that the calamity requires a national response and should be declared as a natural disaster and national disaster. The petitioner also submitted the point of all the Union Territories and States coming together to help in such a situation. The Attorney General Mukul Rohatgi, appearing for the Centre, informed the Court that the Union Government is aware of the situation and a committee headed by Prime Minister is overseeing and co-ordinating the rescue and relief operations. The great work being done by the Army was also highlighted by Mr. Mukul Rohtagi and he also informed that the Chief of Army Staff himself is monitoring these operations. The petitioners also acknowledged the stupendous work being done by the army but also said that the situation required more. The Bench headed by the Chief Justice R M Lodha in its order said “It needs no emphasis from us that a calamity and disaster as huge as this deserves national response so that immediate relief is made available to the victims of floods.” It also said that it is not in doubt that government of India is concerned about the calamity. However, it asked the Govt. to consider the points mentioned by Sr. Adv. Colin Gonsalves. Floods in Kashmir have made the death toll go beyond 200, and over 1, 30,000/- persons have been rescued so far. Air Force, Army and Navy along with the team of NDRF have been put into action in the state. The army has deployed around 30,000 soldiers for rescue and relief operations. Distribution of foods packets, water and other essential materials is also being done. 80 medical teams of the Armed Forces Medical Services are operating in full swing. Four field hospitals have also been established. Several airlines too have been flying people out from Jammu and Kashmir, without any charges. However, the locals feel that much more is required, with the death toll increasing day by day. Meanwhile, more relief materials including blankets, water bottles and food packets are being airlifted from Hyderabad, Ahmedabad, Delhi, Patna, Amritsar and Chandigarh.